FARGO, N.D. — A five-run third inning was the catalyst as the RedHawks beat the American Association-leading Sioux City Explorers 7-3 in front of 3153 fans at Newman Outdoor Field on Monday night. The Explorers got on the board first with three runs in the second inning, but five runs for the RedHawks with two outs in the third gave the home team a lead it would not relinquish. Leo Pina tripled home two runs and Keury De La Cruz hit a two-run homer to right-center field to give the Hawks a 5-3 lead a third of the way through the game. 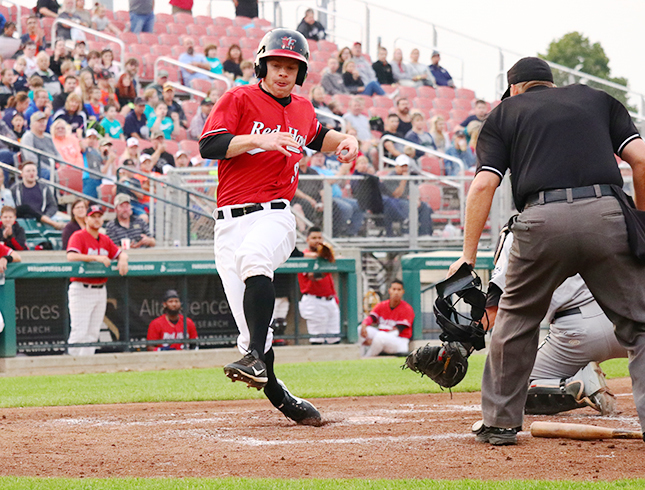 De La Cruz’s homer marked his fifteenth of the year — the DH hit 19 homers for the RedHawks in 2016 and nine last season. DLC finished tonight’s game three for four and a triple short of the cycle. DJ Brown earned his ninth win of the season with a seven-inning, six-hit performance tonight against the Xs. Brown gave up three runs — all in the second inning — and struck out four to earn his first win in August and move to 9-2 for the year. Both starters, Brown and Sioux City’s James Dykstra, held the score at 5-3 through the eighth inning, and Geoff Broussard came out of the Fargo-Moorhead bullpen to keep the two-run lead alive heading to the ninth. Broussard worked out of a jam with runners on second and third and struck out Sioux City’s Dexture McCall to keep the RedHawks lead intact. The Hawks added on two more runs in the eighth on a two-run single from Charlie Valerio to extend their lead to four runs before Randy McCurry came on in the ninth to finish the game. Fargo-Moorhead will try to win the three-game series with the Xs tomorrow night at Newman Outdoor Field. First pitch is scheduled for 7:02 PM.